Observe a variety of small mammals in this fascinating building divided by a day and night side. You’ll be able to observe all animals during their active time. The fennec fox is the smallest of all the world’s foxes. 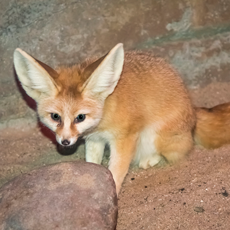 The ears of a fennec fox can measure to be roughly 6 inches. Living in the desert, the fennec fox is able to go long periods without water.